Hill climb of a different type to witness a spectacular sun rise or just for the thrill of the panoramic views of Sri Lanka or for pleasure . Not just a trail but a prilgimage to a summit secred to all of the world’s major releigions. The Peak is one of the highest on the island at 2,224m and lies within the Peak Wilderness Sanctuary. The season is between December and April when the summit is not misty and relatively dry. 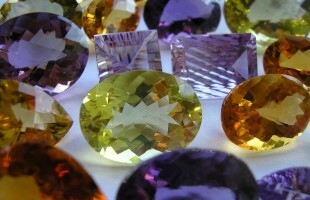 There are two popular starting points from the directions of Hatton or Ratnapura. Easily recognisable from many areas of the western / southern parts of the country because of it’s triangle shape summit as well as from the sea to the west. 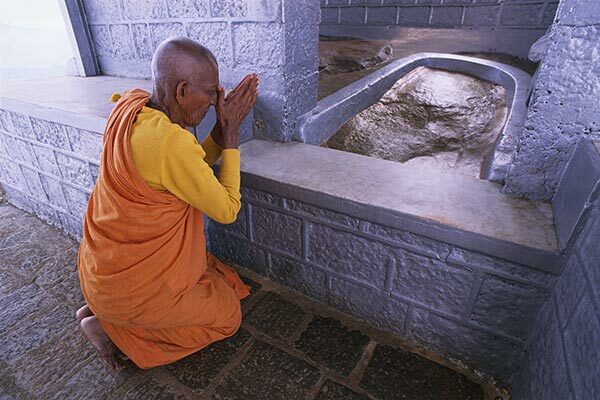 Secret to Christians Muslims as well as Hindus while to Buddhist it is one of the places where Buddha has visited and left a footprint. Today it has been covered by a boulder. The first climbs dates back to 1000AD by then king Vijayabahu I who had built resting places for travellers. Travellers like Ibn Batuta a Arab pilgrim (1304-1377), and Marco Polo (1254-1324) have recorded visiting the summit. The holy mountain of Adam’s Peak is also known as Sri Pada ( Holy Foot) and Samanalakande (Butterfly Mountain). Legend says that the Buddha rested his foot here on his way across the island, leaving a large footprint behind on its pinnacle. Christians and Muslims believe the print belongs to Adam who was led here by angels after being expelled from Eden, while Hindus venerate it as the footprint of the God Shiva. Holy to all major faiths, this beautiful mountain is a major site for pilgrimage and worship. 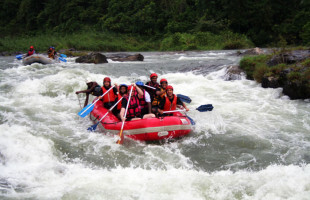 It is surrounded by superb tropical montane forest and stunning vistas all around. Whether you believe that the large footprint enclosed within the parapet at the summit is indeed holy or not, the climb is certainly more than worth the stunning views all around. Also worth witnessing is the sight of the beautiful shadow of the mountain just after sunrise. Once you have successfully conquered the Peak, you will be entitled to ring the bell at the top, once for each ascent you have made. The beauty and grandeur of the scenery that the mountain looks down upon are eclipsed by the magic of the sunrise seen from its summit and the resulting perfect triangular shadow thrown across the plains below. The shadow is visible for only about 10 minutes or so after dawn and such perfection has been recorded for only one other mountain in the world. It has completely enthralled everyone who has seen it and to do so, the ascent must be made during the cold night, along what is surely the longest stairway in the world; a stairway to heaven. Thousands of years of pilgrimage have worn the paths on this holy mountain. The Persian poet Ashref wrote of steps cut and chains placed along the ascent by Alexander the Great. 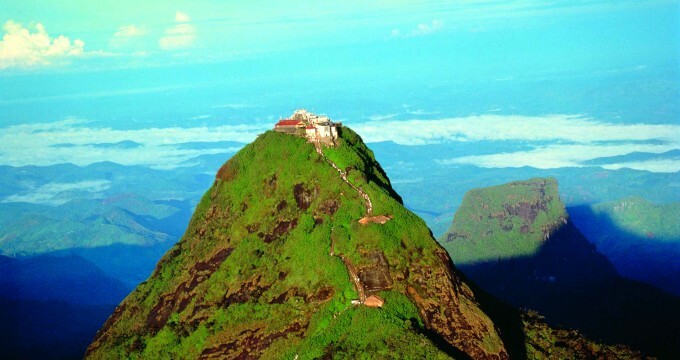 This would mean the mountain was deemed sacred even before Buddhism was brought to Sri Lanka. Another great king, Parakrama Bahu, is also said to have climbed the Peak to worship at the shrine at its top and instructed that a temple be built there towards the end of the first millennium. Many consequent kings followed these and the footsteps of countless lesser mortals in reverence. Ibn Battuta, the intrepid Muslim traveller from Morocco, climbed the same path in 1344 and wrote of two routes to the summit. He describes one as the Baba (Adam) and the other as the Mama (Eve) track. The second one is supposed to be easier with most pilgrims returning by this and so anyone ascending this way is not considered to have made the true pilgrimage. The former route is an arduous and difficult climb. However, thousands of men, women and children make it to the top every year to accomplish this important pilgrimage, even the elderly. The classical track starts in Ratnapura and takes 7 hours through Gilimale and Carney Estate although there are other, less punishing routes. The one taken by most climbers is 7km long starting from Dalhousie, along steps most of the way. During the pilgrimage season (December to April), the whole ascent is lit and there are many rest stops and refreshments available along the way. At other times you will need a torch. The climb starts easily enough with a gradual slope but soon becomes steeper and steeper. It is advisable to take warm clothing as the temperature plummets during the night and it can be very windy. Unfortunately, this holy mountian is in danger of becoming a monumental garbage dump as visitors leave their litter going up and down. Busses are From Hatton, Special Bus service to Sri Pada is available from various destinations. Alternatively visitors by bus from Colombo (or else where) may first go to Maskeliya and then to Delhousie where vehicular approaches end. The trail is around 8 kM. And the climb would take 2-3 hours minimum depending on how fit you are. The forest around the area is a wild life sanctuary famous for its butterflies but also and contains a wealth of flora and fauna. The sunrise is spectacular and the scenic beauty of the climb is superb. Most people climb to watch the sunrise from the summit and therefore start at late night. There are several resting places along the routes. Both routes are well lit and marked.